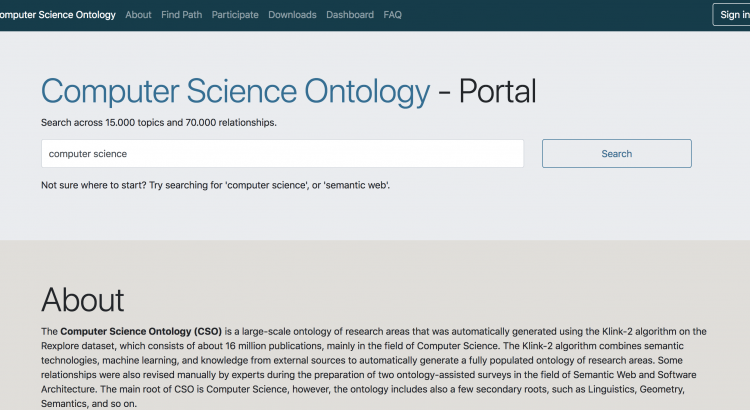 The Computer Science Ontology Portal (also referred to simply as CSO Portal) is a web application that enables users to download, explore, and provide granular feedback on CSO at different levels. This last feature allows us to periodically review the status ontology and release new version according to the received feedbacks. A user can explore the ontology in an interactive manner by clicking on a topic, viewing the information associated with it, and then following on to the next topic. In addition, users can download the ontology and import it in their own triple-store and then creating new applications based on it. Registered users will be able to see different menus, where they can provide different kinds of feedbacks: ontology level, topic level, relationship level and also suggest new relationships. Finally, there is the editorial board who aim at producing a new version of the ontology. We submitted a paper at the 17th International Semantic Web Conference (ISWC2018) Resource Track, describing both the Computer Science Ontology and the portal described here. The portal is available at this link: https://cso.kmi.open.ac.uk. We look forward to receive feedbacks from you.